I just wanted to let everyone know that I have started up a Red Worm Composting “Fan Page” on Facebook. One of our readers suggested I do this quite some time ago, and I actually DID technically set it up not all that long afterwards – but I ended up a bit bogged down with figuring out exactly how it operates, and basically put it on the backburner until today. Somehow, during the time it was just sitting there, seven people managed to find it and become fans – so a big thanks goes out to those pioneers! Not sure if they are fans of the website, or if they just happened to stumble across the page – but whatever the case, it was nice to see (and it helped inspire me to really get the page up and running). Apart from wanting to create a more interactive place for all of us to hang-out and chat, I thought it would be great to set up a Fan Page since a number of Red Worm Composting readers have tracked down my own profile on Facebook and requested to be added as a friend. Let me start by apologizing to those who have, since I’ve almost certainly not accepted the friendship request, simply because I prefer to reserve my own account for family and friends (and for some strange reason, a bunch of people I haven’t seen since grade school – haha). Believe it or not, I do tend to be a pretty private person, and as such, have opted not to use my own account for business/promotional purposes at all. Please don’t take that the wrong way – in all honesty, it doesn’t take all that much for me to consider you a “friend” (if we have fairly regular email correspondence, for example) – I just prefer not to add people I haven’t really interacted with all that much. With that “Debbie Downer” motivational speech out of the way (haha) – I AM very excited about the fan page and want ALL my readers (who are on Facebook) to join! Let’s make this into a rockin vermicomposting party! To sign up, all you have to do is click the “become a fan” link in the badge I’ve included in this post and you are all set! Oh well – we are indeed our own harshest critics, right?? Anyway, I’m still very glad I did it – and once again would like send a big THANKS to Frank for inviting me to take part! 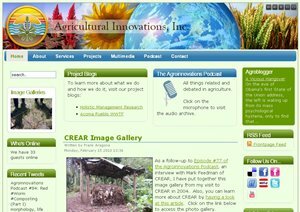 A number of weeks ago I was contacted by Frank Aragona, owner of Agricultural Innovations Inc, and host of the Agroinnovations Podcast, inquiring if I’d be interested in taking part in an interview for the weekly show. I was very flattered by the request, and heartily agreed to take part, despite the fact that I was a tad nervous about the prospect of being interviewed. Frank and I had a few back a forth exchanges trying to figure out a time that worked well for both of us, and thankfully we were finally able to nail down a specific date and time (two weeks ago today). As you’ll likely notice, I was indeed a tad nervous to begin with, and tended to wander a bit from time to time, but I REALLY enjoyed talking with Frank (who had lots of great questions and some interesting insights), and think everything came together nicely. Since I did tend to provide rather lengthy responses, the interview ended up running for an hour, so Frank has decided to break it into two parts – part one being posted today. Ok, enough chatter – here is the first part of my interview (just click on the little play button). Hope you enjoy it!